The Obi of Onitsha, His Royal Highness, Igwe Nnaemeka Alfred Ugochukwu Achebe, gave his blessings to commence the Red Cap ceremony in Onitsha, Anambra State, on Saturday, May 12, 2018, amid applause and excitement by hundreds of Nigerians who thronged the venue of the event, the King’s Courtyard, Ikpeazu Stadium, Onitsha. The red cap ideology is of high importance to the South Eastern people of Nigeria as it represents the peak of achievement, societal status and recognition for any individual or brand. Launched into the Nigerian market in August 2012 without much fanfare, Hero lager beer warmed its way into the hearts of consumers in the South Eastern region and became a symbol of inspiration. The success of the brand draws from its strategic cultural resonance with the people and has catapulted Hero Lager from zero to a market leader in the region. Furthermore, consumers have christened Hero, ‘Oh Mpa’, in reverence and as a mark of respect (Mpa means father in Igbo language). Speaking when he received the International Breweries Plc team in his palace, HRH, Igwe Achebe commended the management of the company for the honour of commemorating the milestone in Onitsha, the commercial nerve-centre of Anambra State and home to one of its plants. 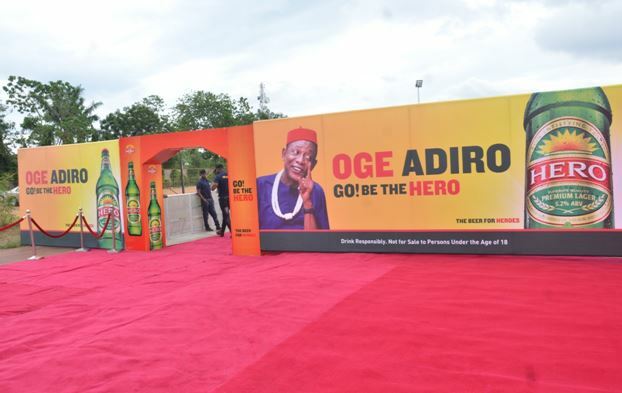 Igwe Achebe added that Hero lager beer is a premium brew crafted by the people and for the people, a beer that is a rallying point to all Igbo men and others who need that new strong center of hope and strength to accomplish great things. 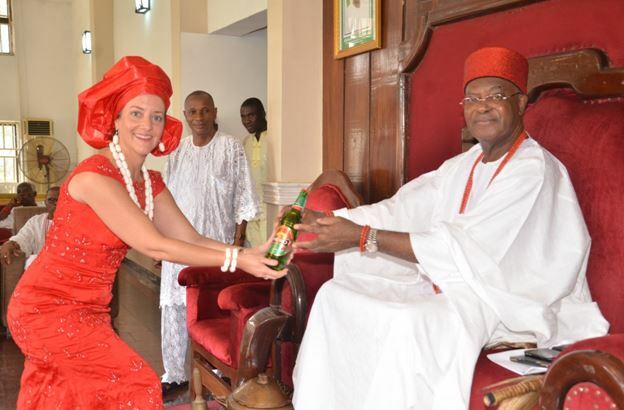 Hero is also the first beer brand to be awarded a symbolic title in Nigeria. Arne Rust, Marketing Director, International Breweries Plc., said the ceremony represents the essence of the brand. “Through this ceremony, we hope to inspire consumers to be heroes every day and in every way. We have great plans for our consumers in Nigeria, part of which includes strategically launching several beer brands to suit specific geography and cultures. Hero is a well-established brand in the eastern part of the country. International Breweries Plc., genuinely cares for the culture and tradition of the people, and we will consistently seek ways to showcase our culture and positively impact the society,” he said.